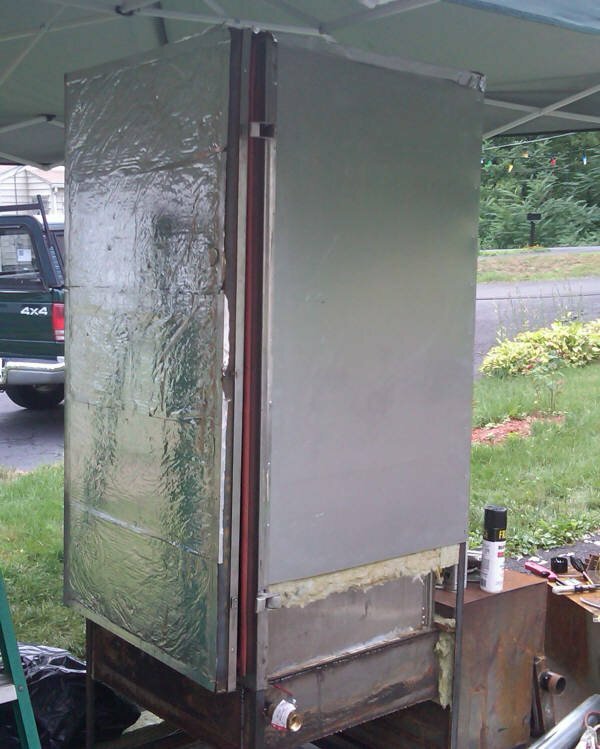 I built this one in 2011, so here is a recap of my cabinet smoker made from a double wide industrial refrigerator. 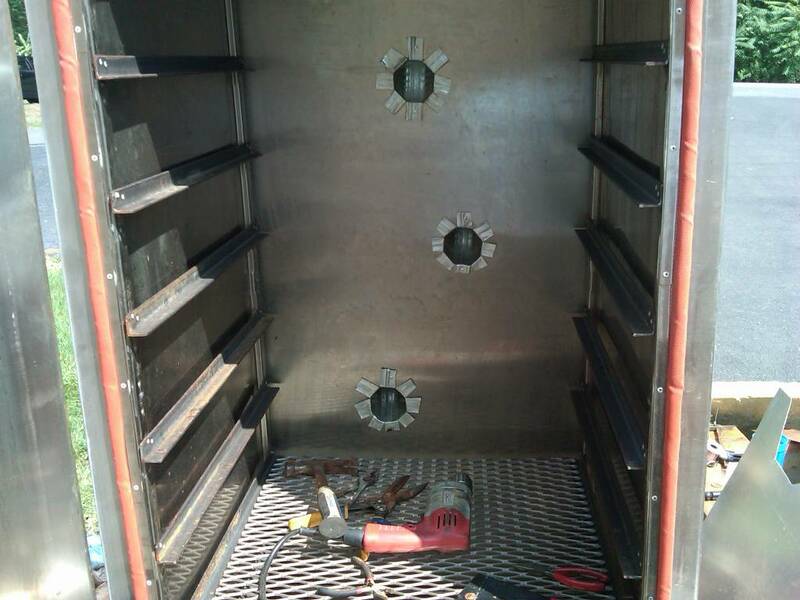 The original unit had been stripped of the exterior stainless and doors, and the compressor was gone... so all I had to do was chisel off the foam to reveal two really nice SS cabinets. That much was free. 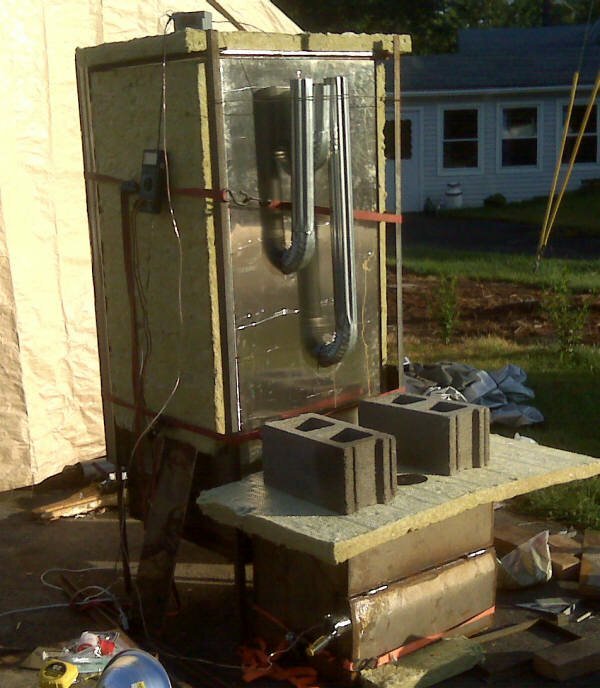 I built a exoskeleton out of angle iron and insulated everything with 2 inch rock wool. I riveted in 8 pairs of angle iron rails and built the 24x24 racks. To get a reverse flow action going, I put the stack vent holes towards the bottom of the CC. The outer skin is aluminum. 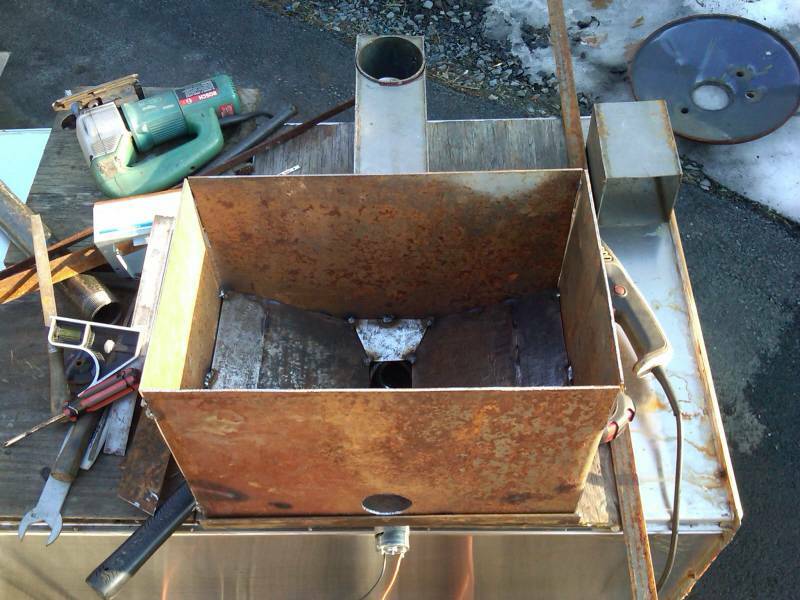 I started down the path of wanting to make it a pellet burner, and decided to build the pellet system from scratch. Just a few pictures of that work to show I gave it a good try. 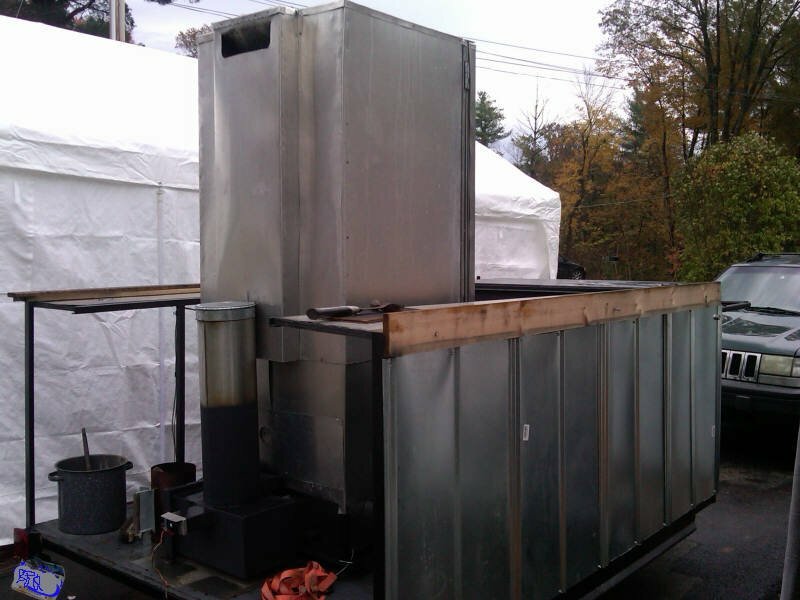 I ended up dropping the pellet drive motor/auger assembly, and it never worked right after that, so had to I built a quick and easy (and really light) gravity fed firebox to get it ready for a large event. Since then, I have done a few large cooks around just over and under 200 lbs, and several more around 125, 100, 75 and 50 lbs. 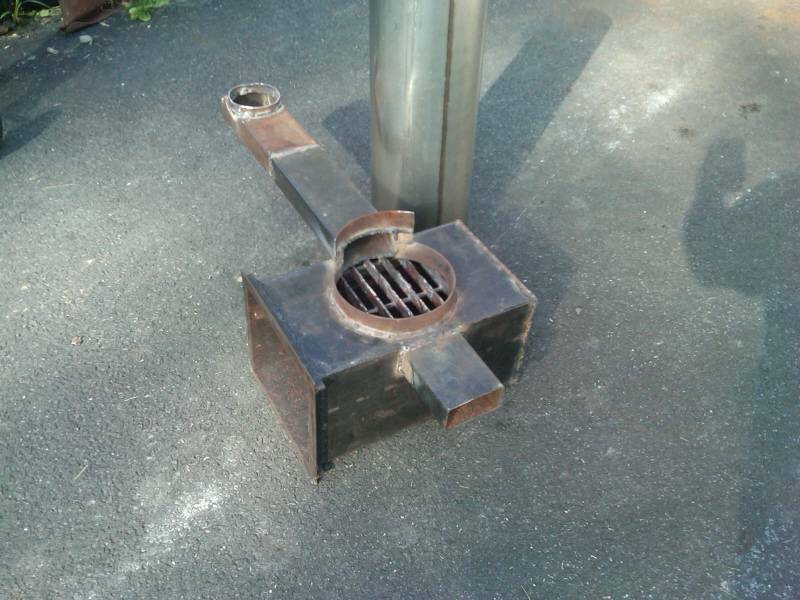 The quickie firebox has lasted 6 years. The firebox needs rebuilding so thats why I'm here. Planning to go thicker in some areas, since the original was 1/8 inch plate and a really thin stainless chute. That is a nice build. ajfoxy wrote: That is a nice build. Ah, the icons looked like 3 cups of butter to me ! Post mortem update... the firebox is dead. Heres the hole that appeared on my last cook. 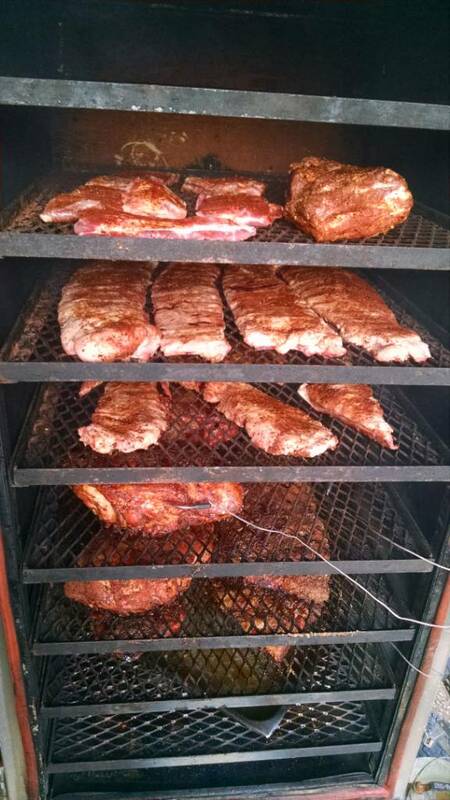 I need a firebox makeover before I can run my fridge cabinet smoker again. No surprise that this thinwall FB eventually burned through. Everything else on the cabinet is doing well, although have some improvements in the mental marinade for the drip pan and heat transfer tube at the bottom of the cabinet . 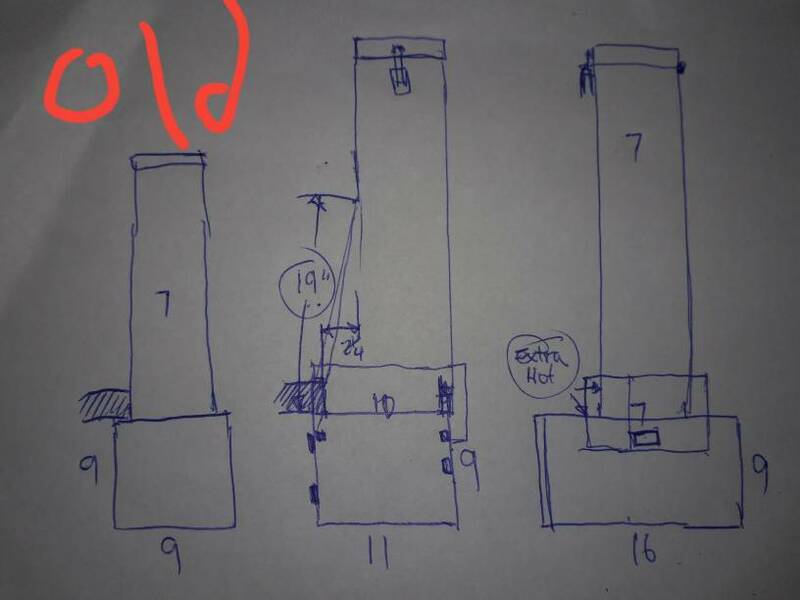 I drawed up plans for a new firebox to get some more ash and chute capacity from the same basic space I have available... time to start collecting materials so I can burn some wire on a new FB. 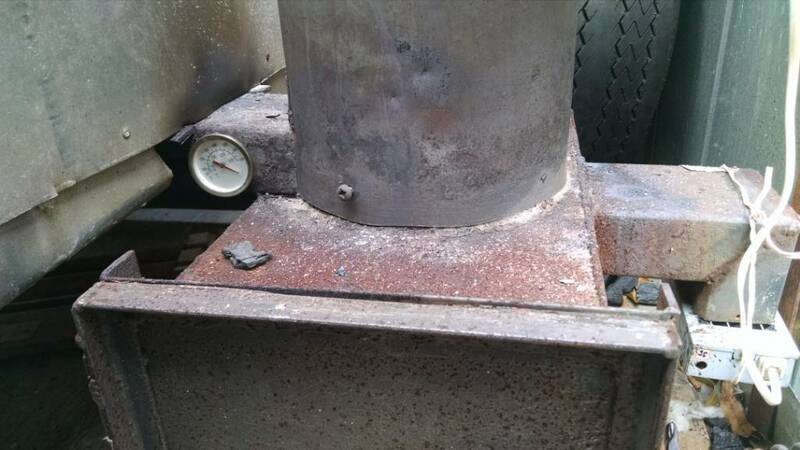 You can see where the heat is concentrated in the second picture. The ash box and 2x4 tubing and angle iron is just 1/8" thick, and the grate is 1"x1/4" stair tread. 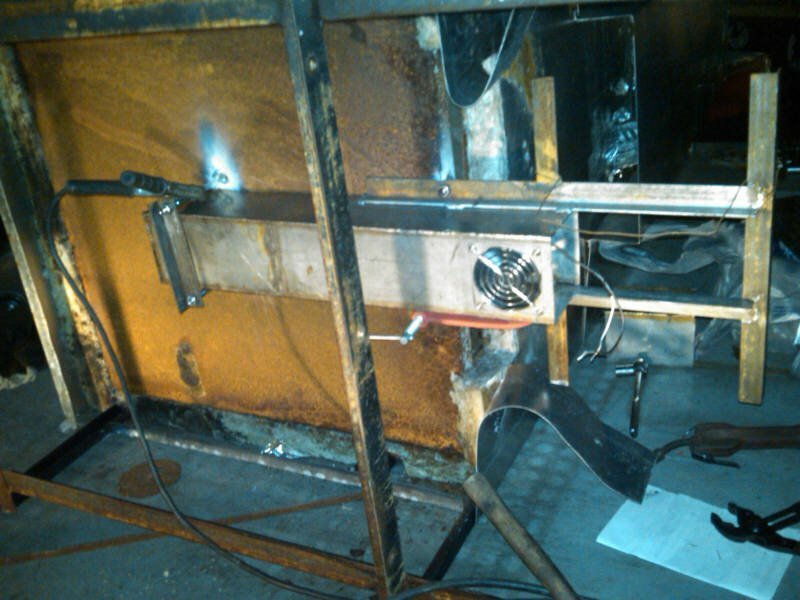 The chute is like a 7.5" dia stainless stove pipe. The FB weighed about 30-40 pounds.... really light! I always use a stoker fan, for the past 3-4 years I have been using 2*6 mm fans. 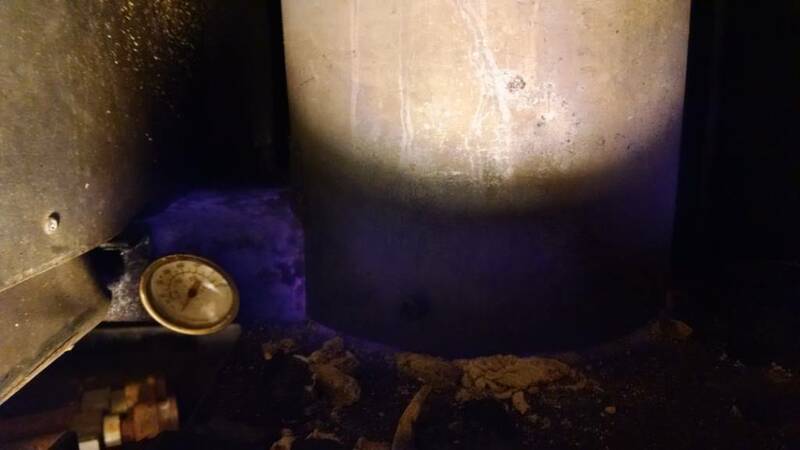 You can see from the thermometer that it cranks out some serious heat, and I have measured with a thermocouple 1200 F when it is pushing hard with small charcoal in the chute. The third picture is from a couple years ago, and shows a couple of dents in the area that eventually burned through. I remember tapping the chute with the wrong kind of object, like a slag hammer or something. Wonder if that made a weak spot ? Keep in mind I made this from stuff I had laying around, and wanted to see/show where the heat is in the GF charcoal type of FB. 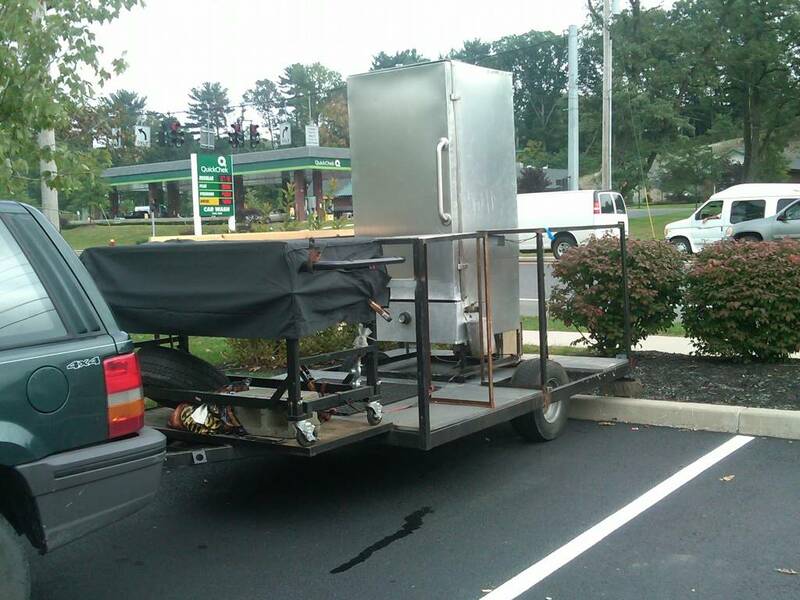 You definitely got your monies worth out of it. I wouldn't have thought 1/8'' metal would've lasted that long. Only 1/2" RC??? My, you have mellowed. I know what you mean, I didn’t want to scare him off. Rodcrafter wrote: I know what you mean, I didn’t want to scare him off. How much should materials for a "typical" GF chute and firebox cost, assuming the optimal (not crazy) thickness in the right places ? 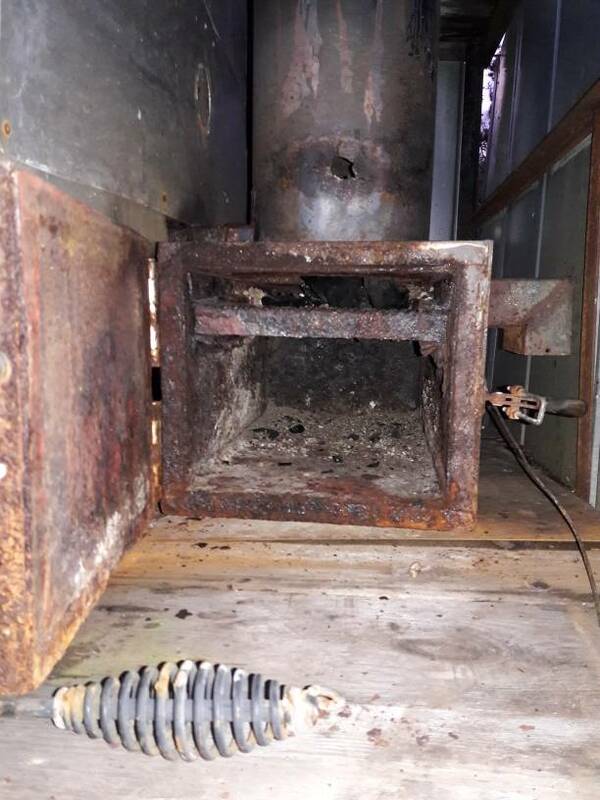 I guess I will have to spend some money on the next one... thinking I may go as thick as 1/4" or 3/8" on a few pieces on a new ash box and lower chute - where I can see all the heat. No need to go thicker where it is holding up good, right ?? 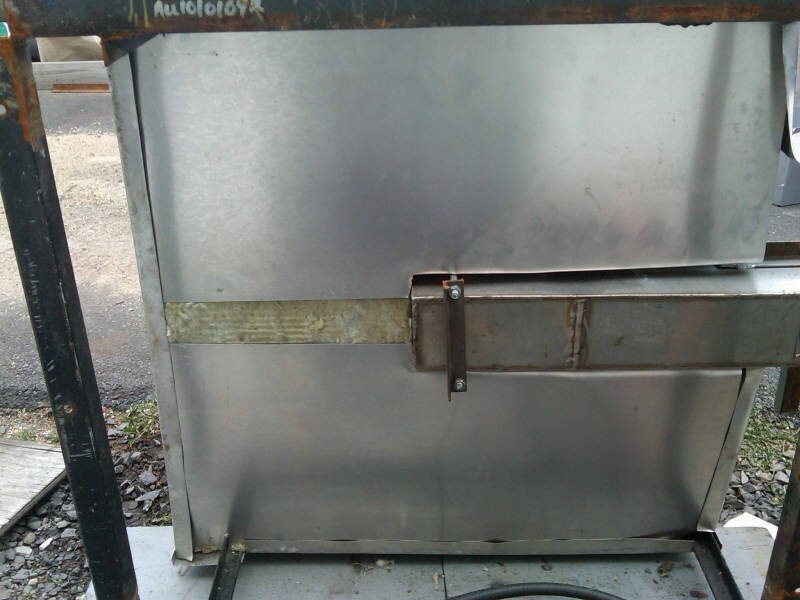 I am surprised that the 1/8" 2x4 transfer tube is not flaking out or showing any signs of heat damage... it routinely sees 1000F on the first pull and after keeping the door open to add more cold meat. 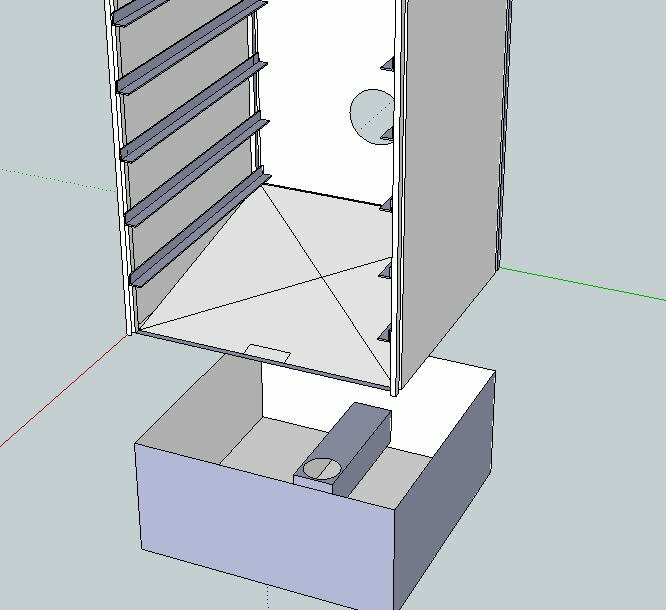 My new design will have two transfer tubes, one for each side of the cabinet. 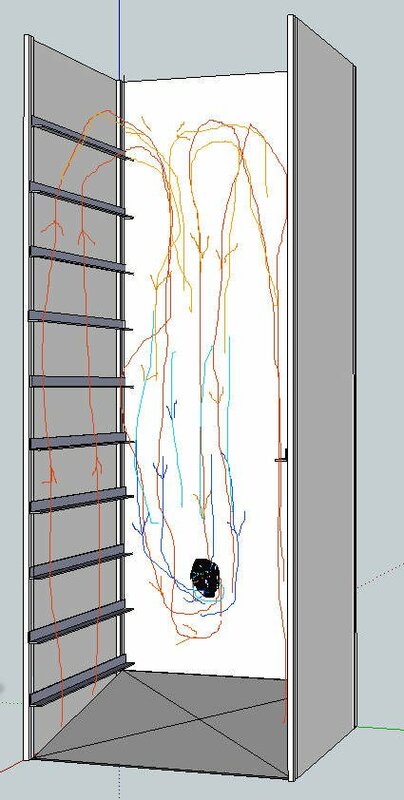 I also plan to use some double wall "insulation" around the hottest part of the FB since mine is external. Ok, so how much for typical FB.... gotta set a price (and weight) to beat. Heat is no problem with charcoal and a stoker fan ! Here is what I am thinking for the new FB dimensions and a couple of improvements. Square chute, with a wider taper towards the bottom and enough volume to hold more coal than the old one. That means more nap time between feedings. 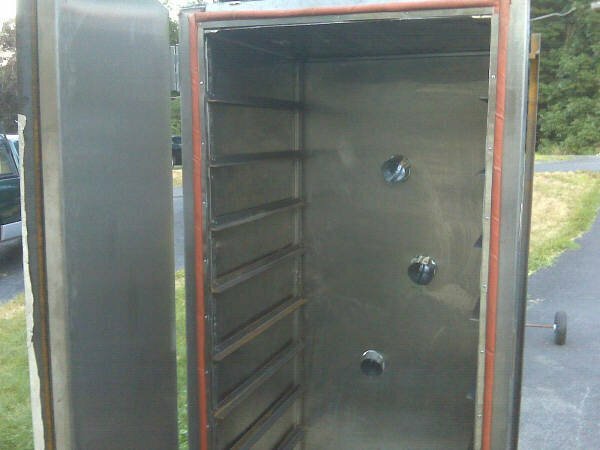 Chute lid and FB door with real BBQ smoker grade hinges and latches that wont rust or fall apart. Double wall construction around the hottest areas of the FB and chute ... will route the intake air through the cavity for cooling, while warming the intake air going into the FB. 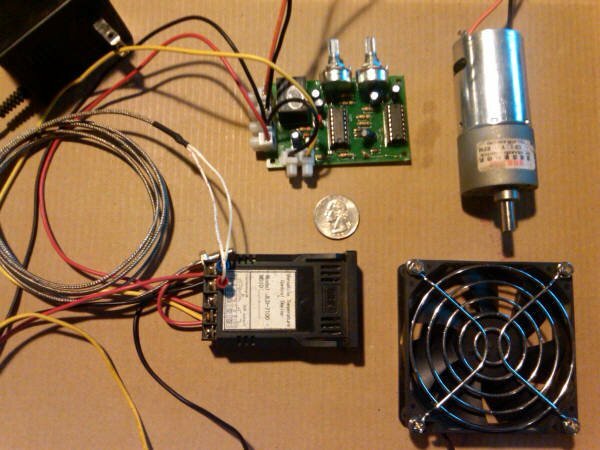 The stoker fan(s) will have to be easy to mount/remove in a place where they can not get too hot. It looks like you've got it figured out. 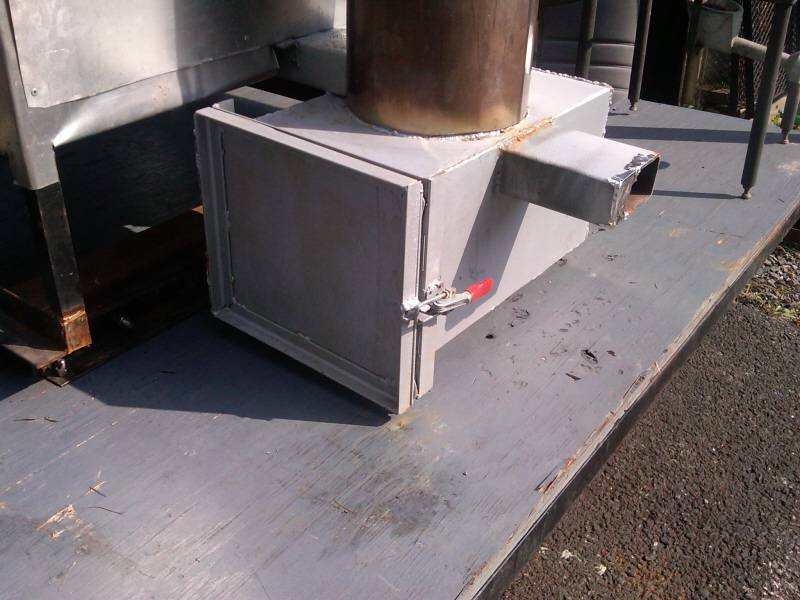 Most guys use 1/2'' steel plate for the fire box area to withstand the heat.